I have been told that when my friends see matcha anywhere, they immediately think of me. Lol. I can't blame them though for I consider myself a matcha addict eversince I've had that drink in Starbucks circa 2009. I wanted to go here in Tsujiri during their opening day last April but that was the ASEAN weekend so I was elsewhere. Fast forward today, I have been there twice both times went out of the store fully satisfied with my happy meter back to level 100. ANORAW. :))) All I know is matcha makes me happy. Above is their current menu and prices. Green square means they're pure matcha, white square means it's milk based. While waiting for our order. Tsujiri, the whole S Maison actually, is very quiet with only few people. It doesn't feel like you're just a bridge away from Mall of Asia. 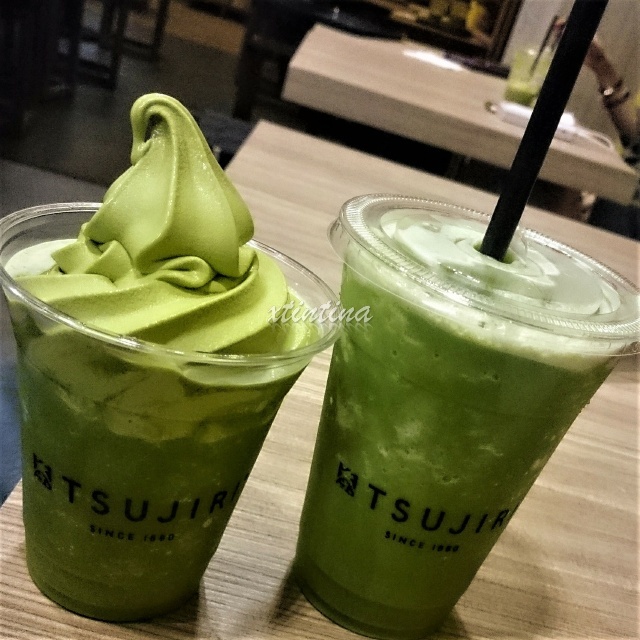 To be honest, I find their ice blended ordinary probably because I've always been having ice blended matcha in other stores so I got used to the taste already but putting their version of soft-serve ice cream? Wala na. May nanalo na. Sinarapan, bes. :))) hahaha I loved their ice cream so much. It's the perfect matcha taste for me. So this is during the second time I went there. I wanted to try one of their shaved ice but it wasn't available that day hence, repeat orders. I'll brave EDSA traffic for you kind of love haha! Since I also liked their lava cake, I paired it with a vanilla ice cream this time just because I want something else. haha! I'll be back for a third time, Tsujiri! <3 Sulit ang 155 years kong paghihintay sa'yo... <3 <3 <3 Sana sa Japan naman. Char!